Team Shinoda builds a whole set of Boss Shinodas for 2008. They have the 429, Legacy, Level 1, Level 2 (S, T, and FR), and Level 3. The packages contain different body kits, interior trim, wheels, and badging as well as engine and handling performance upgrades. 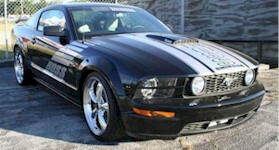 Black 2008 Mustang Boss Shinoda Level 2 coupe with a turbocharged 553hp and 575 ft-lbs of torque, V8 engine. This power comes from a Boss intercooled turbocharger, Shinoda engine management software, JBA performance exhaust, and a Hurst Competition close ratio shifter. This car is serial number 001 as branded on the front left bumper.